As promised earlier I have posted some of our early roses in our Spring garden. The roses which always show themselves first are the Climbing Roses, such as Lorraine Lee as seen in the first pic, followed by Zephrine Druin, then Dublin Bay, Pierre deRonsard, Cecile Brunner and finally Crepiscule (not quite out as yet). Grannies Bonnets, Lavenders, Foxgloves, a Lemon tree, Valarian and Orange Blossom. 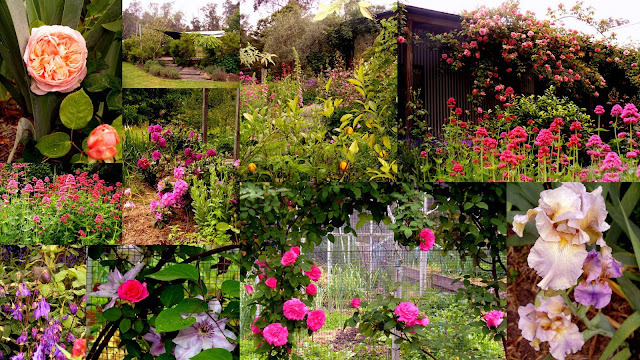 And finally here is a mosaic I made to show the garden as it is at present but, as you know, gardens are continually growing and changing so the next garden post will display many more roses for your enjoyment! What a glorious scene your garden must be Suzy.The scent must be heavenly.I love the "wilder" Cottage Garden style. These type of gardens are always a delight as things pop up that have been dormant during Winter, have self seeded elsewhere in the garden, new things get blown in by the wind. ....Always a surprise. Hope you are having a lovely relaxing weekend. I'm up to my elbows in clowns.Hmmm!!! All I can say is "oh my" ... how very beautiful! You are so lucky to have spring again and all these lovely roses. Well, your roses are gorgeous no matter the season! It makes me really happy to be able to share all of this Spring splendour! I have to say it really is a beautiful garden especially this time of year but, at the same time, it requires an immense amount of work at different times but Jeff and I get heaps of pleasure in getting our green hands dirty to achieve these results. Not to mention the abundance from the vegi and fruit garden also. I'm so happy to be able to see your beautiful garden as we decend into a cold autumn & winter. Of course, some treat this time of year over in the UK as the start of it all! hi all, I am in the development of finalizing my grc meaningful beauty buying. I've gone through various portals and eventuallythis [url=http://www.fetruth.com/meaningful-beauty-reviews-can-it-definitely-operate/]meaningful beauty[/url] site looks worth trusting. Any member here have any experience doing business with them?